Native Americans - and in many ways, probably all soldiers from pre-guerrilla times - went to battle in grand costumes not because they wanted to show off for their enemies, but because they wanted to show off for god. If they died that fateful day, at least they'd be dressed to meet their maker. One could use a similar philosophy to justify spending $500 for house slippers. Dress up for yourself, dress up for God. You never know when accidents are going to happen. 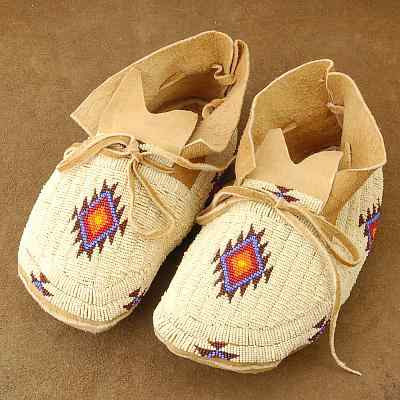 Custom Choctaw moccasins from Native American Eagle River, $492. I'm finding it pretty near impossible to imagine you dressed as a squaw Hovey, and though I'm sure a lot of work goes in to the making of these things, I reckon $500 could be better spent. Did you buy a pair or is it an idle fancy? How could you justify spending nearly 500 for house slippers? I could see those being sold for 50...tops. Thank you, Victoria! Yes, some poor woman intricately beaded those puppies by hand. It would probably be a shame to ever let them touch feet. I vote for art as well. These would be best under glass not underfoot. A shame not to use things for their intended purpose though don't you think? Beautful glasses should be drunk from, lovely crockery used, vintage racing cars raced and perhaps even......slippers.....? Just a thought. Time for a drink! Isn't it better to wear art, if you can? Tattered a bit, they'd look swell 50 years from now in the Visible Storage Gallery at the Met. Funny, when you think about the price of a handbag, that we might blink at this. The artist who beaded them deserves the honor. Art for the feet. So Hovey! Delightful. I agree, I also bead and my moccs are fully beadeded as well and 500 is pricy but they are hand-made. Not many items you buy are hand-made anymore, and it takes hours. Mocc. are usually worn in ceremonies or they dance with them.